Samantha just loves to go out. She knows that when I dress her up, it means that we would go out. It doesn't matter where, as long as its out. She loves going to the groceries, to our prayer meeting, to the church or to the mall. But today's theme is all about the mall and while browsing my archives, I find that I don't have much photos inside the mall! Oh no! At SM City Davao where we had our family picture. Samantha was fascinated with Jollibee that she pinched his cheek. 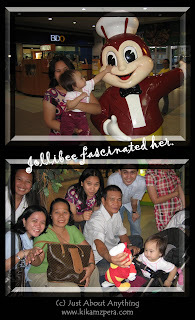 She was all eyes at the small Jollibee toy that my father was holding. 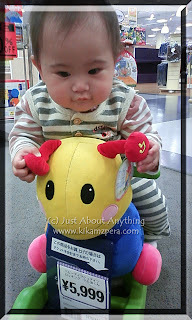 One of our favorite stores back in Japan is Babies R Us. Samantha was sampling this soft rocker and she enjoyed the ride! A day at the mall is never complete without a meal. It is indeed tiring and energy-consuming to go window shopping so that a trip to the mall is always concluded with lunch or dinner at the restaurant. I am afraid I don't have recent photos of us malling here in Germany. I'll be sure to take some snaps the next time we go out. Share your malling moments with us here at Mommy Moments! so cute, shes enjoying her ride at soft rocker! 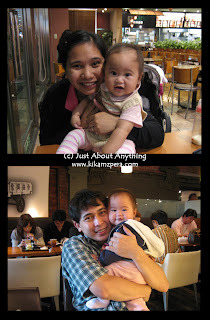 cute cute baby.. Magala pala yang baby na yan ha..
gosh super cute talaga ni Sam :D Naligaw ako dun sa isang version ng Just About Anything hehehe! Wow Jollibee! Your daughter is getting prettier each day! glad you can join us this week! :D sam is so cute talaga! Gusto ko magjabi hehehe, kala ko may jolibee dyan hehehe.. Buti pa sa tin kahit saan ka pumunta may jBi outlet ano..